Advocating nonviolent disobedience, Mahatma Gandhi not only led India to independence but also was the inspiration for civil rights and freedom movements worldwide. While in India, Paul Hodge has often explored many aspects of Mahatma Gandhi’s life. This photo shows Paul at Birla House aka Gandhi Smriti in New Delhi, India where Gandhi was assassinated at his daily prayer meeting on January 30, 1948. 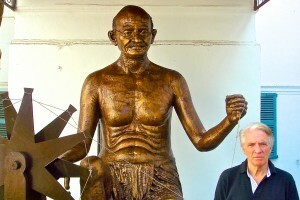 The spinning wheel in the Gandhi sculpture which Paul is standing next to is a famous symbol created by Gandhi. The Mahatma advocated the boycott of European clothing because it caused large scale unemployment in India. He encouraged all Indians to devote a certain portion of their day to spinning cotton into Khadi, a hand made cloth which was cheap and a reliable fabric for poor Indians. To Gandhi, spinning the Khadi, encouraged Indians to seek their freedom from England and become more self reliant.